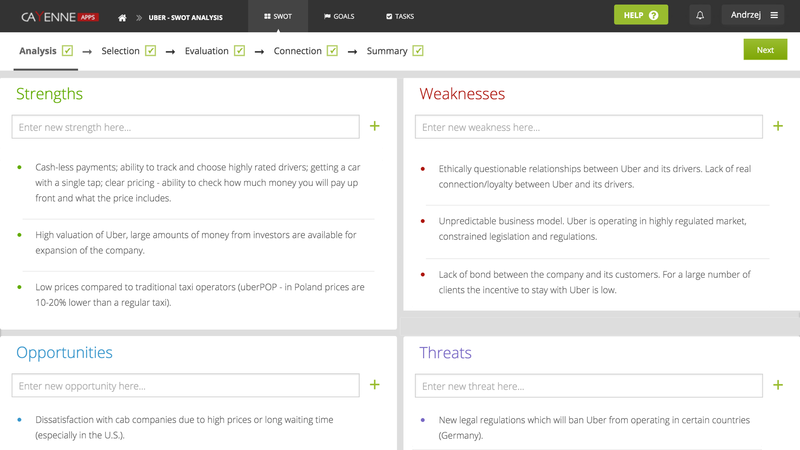 Create the most comprehensive analysis of Strengths, Weaknesses, Opportunities and Threats. Build up your strategy, and turn the most promising ideas into workable plans. by clicking, you agree to terms and conditions. Love what you've done with the SWOT tool - you've turned a routine (and often overlooked) tool into something practical and insightful. I just finished SWOT analysis and I have to say I loved it. Very powerful and useful. If your an entrepreneur this is a must! With CayenneApps SWOT you don't need to read 200 pages book about SWOT Analysis to get started - it will lead you by hand through 5 simple steps. Join thousands of small and large companies which use SWOT analyses to improve their decision making processes. Get aid from SWOT Summary and discover which features are more important than others. 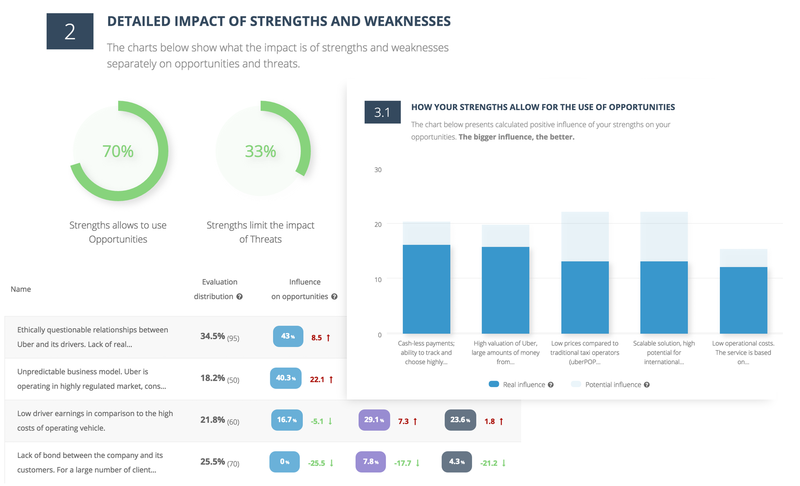 With the provided report you will instantly know how your Strengths influence your Opportunities, and where your weak spots are. 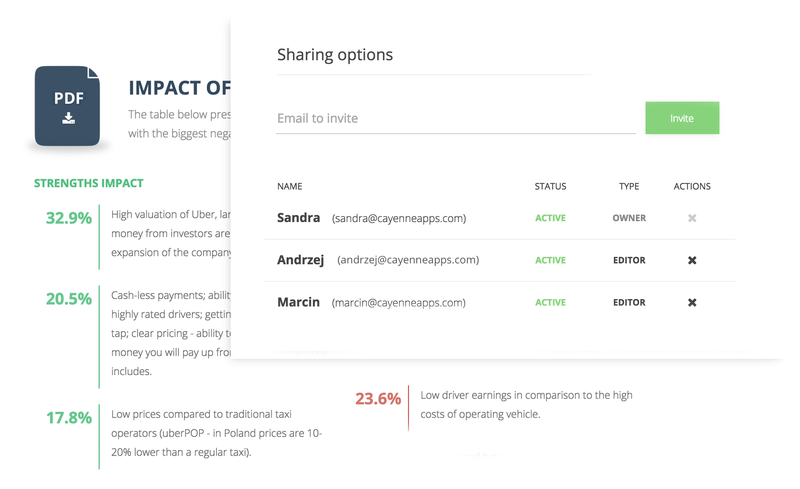 With Project Sharing you can share your analyses with anyone. Just invite a new person via email and start collaborating immediately. When you need to share your work with a broader audience, export your SWOT using PDF Export. The final document will contain both your inputs and generated summary report. Whether you want to start a new business or change you career path you can use our rich Examples Library to find inspiration. 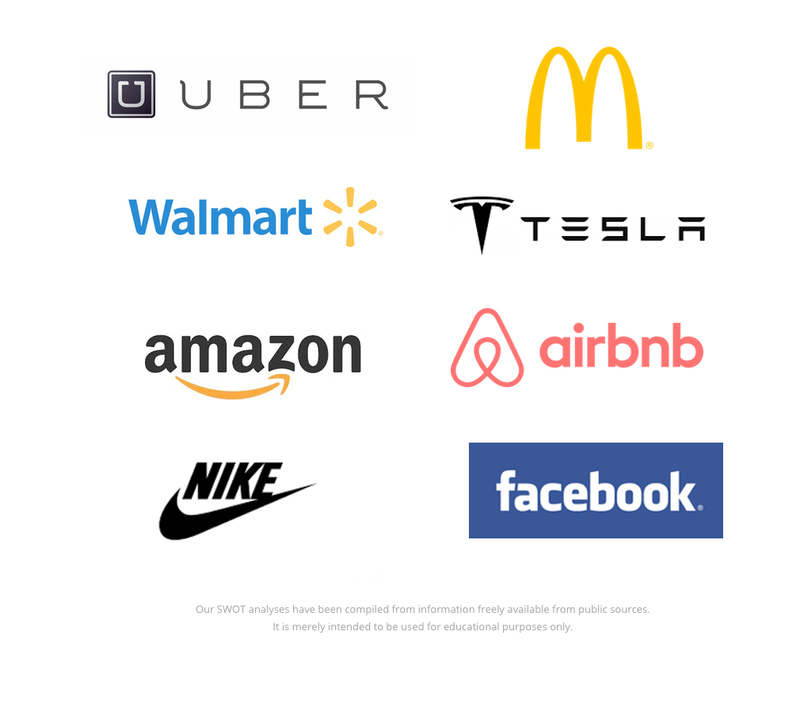 In our library you can find SWOT analyses for new companies such as Airbnb and Uber, mature corporations such as Walmart and McDonalds, as well as general cases such as starting a new coffee shop and finding a new job. All plans start with a 30-day free trial. No credit card is required. Try now and decide later. You'll have access to nearly all features*, so you can learn how CayenneApps works. We don't need your credit card now. After 30 days you'll be asked to pick one of the paid plans. * SWOT Analysis Extended Summary and PDF Export are not available during trial period. No, unfortunately there is no free plan, but each plan comes with a 30 day free trial. Yes, you can upgrade or downgrade your plan anytime you want, but each change will cause a start of a new billing cycle. Please contact us. We will answer your question as soon as possible!